My beloved brethren, how good it is to meet with you once again. 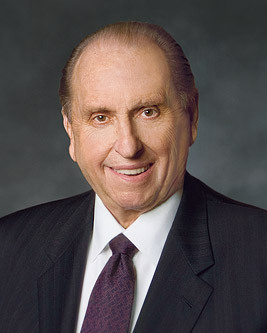 Whenever I attend the general priesthood meeting, I reflect on the teachings of some of God’s noble leaders who have spoken in the general priesthood meetings of the Church. Many have passed to their eternal reward, and yet from the brilliance of their minds, from the depths of their souls, and from the warmth of their hearts, they have given us inspired direction. I share with you tonight some of their teachings concerning the priesthood. How blessed we are to be here in these last days, when the priesthood of God is upon the earth. How privileged we are to bear that priesthood. The priesthood is not so much a gift as it is a commission to serve, a privilege to lift, and an opportunity to bless the lives of others. With these opportunities come responsibilities and duties. I love and cherish the noble word duty and all that it implies. When that same call comes to you and to me, what will be our response? Will we murmur, as did Laman and Lemuel, and say, “This is a hard thing required of us”?7 Or will we, with Nephi, individually declare, “I will go. I will do”? Will we be willing to serve and to obey? At times the wisdom of God appears as being foolish or just too difficult, but one of the greatest and most valuable lessons we can learn in mortality is that when God speaks and a man obeys, that man will always be right. As we perform our duties and exercise our priesthood, we will find true joy. We will experience the satisfaction of having completed our tasks. We have been taught the specific duties of the priesthood which we hold, whether it be the Aaronic or the Melchizedek Priesthood. I urge you to contemplate those duties and then do all within your power to fulfill them. In order to do so, each must be worthy. Let us have ready hands, clean hands, and willing hands, that we may participate in providing what our Heavenly Father would have others receive from Him. If we are not worthy, it is possible to lose the power of the priesthood; and if we lose it, we have lost the essence of exaltation. Let us be worthy to serve. Miracles are everywhere to be found when the priesthood is understood, its power is honored and used properly, and faith is exerted. When faith replaces doubt, when selfless service eliminates selfish striving, the power of God brings to pass His purposes. Such a call of duty—a much less dramatic call but one which nonetheless helped to save a soul—came to me in 1950 when I was a newly called bishop. My responsibilities as a bishop were many and varied, and I tried to the best of my ability to do all that was required of me. The United States was engaged in a different war by then. Because many of our members were serving in the armed services, an assignment came from Church headquarters for all bishops to provide each serviceman a subscription to the Church News and the Improvement Era, the Church’s magazine at that time. In addition, each bishop was asked to write a personal, monthly letter to each serviceman from his ward. Our ward had 23 men in uniform. The priesthood quorums, with effort, supplied the funds for the subscriptions to the publications. I undertook the task, even the duty, to write 23 personal letters each month. After all these years I still have copies of many of my letters and the responses received. Tears come easily when these letters are reread. It is a joy to learn again of a soldier’s pledge to live the gospel, a sailor’s decision to keep faith with his family. Let us learn and contemplate our duty. Let us be willing and worthy to serve. Let us in the performance of our duty follow in the footsteps of the Master. As you and I walk the pathway Jesus walked, we will discover He is more than the babe in Bethlehem, more than the carpenter’s son, more than the greatest teacher ever to live. We will come to know Him as the Son of God, our Savior and our Redeemer. When to Him came the call of duty, He answered, “Father, thy will be done, and the glory be thine forever.”16 May each of us do likewise, I pray in His holy name, the name of Jesus Christ, the Lord, amen.